In true Greek fashion, the originators of democracy will hold a referendum this weekend to determine whether or not Greece accepts the terms of the European Central Bank and International Monetary Fund in the renegotiation of their national debt. Neither side is willing to blink. The Troika want their money, while Tsipras turns his pockets inside out and insists that he can’t give them what he don’t got. Greek banks have since gone into complete meltdown, closing their doors until the outcome is known. Tsipras himself has promised that, should the Greek people agree to the Troika’s conditions, he will step down, refusing to implement what he described as “austerity in perpetuity”. Austerity, of course, is where the fundamental issue lies. The Troika insist that Greece must implement economically responsible cuts to spending and welfare (as if they hadn’t already) as a means to balancing the books. Much like our own Conservative government, however, the Troika overlooks the fact that countries aren’t made up of numbers figures that can be fudged, wangled or manipulated. Someone has to live these financial hardships. The Greek crisis thus represents the Western austerity dilemma: the fetishisms of financiers versus the needs of real people – bureaucracy versus democracy, money versus morality. It is no surprise that Europe’s first distinctly anti-austerity government are being made an example of: heaven forbid they should prioritise the wellbeing of their citizens over the fiscal tyranny of neoliberal officialdom. But making an example of Syriza is folly. The Troika are not holding the Greek government to ransom: they are holding the Greek people to ransom. Unemployment in Greece now sits at 25.6% – the highest in Europe; infant mortality, suicide and HIV have soared as healthcare becomes unaffordable to many; yet the Troika wants more. At what point, then, does financial rationality become moral irresponsibility? We are supposed to live in the liberal Western world: proliferators of democracy, protectors of the people and defenders of human rights. But the possibility of human prosperity does not strictly constitute its reality – certainly not in a capitalist society. Murray Bookchin, in Post-Scarcity Anarchism, argued that “lofty notions of ‘the nation’, ‘the free citizen,’ ‘of equality before the law’” simply masked the reality of the dominance of bourgeois interest. I argue that this bourgeois interest, in modern Western capitalism, has superseded basic human decency. 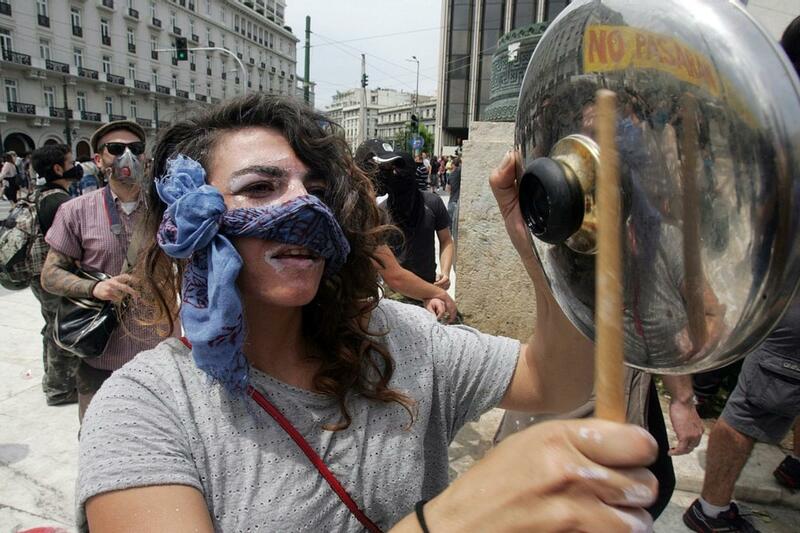 What we’re seeing in Greece is what Bookchin described as a “great bourgeois revolution”. Austerity Europe is a bureaucratic uprising of militant proportions, with Greece playing the role of humanitarian dissenter: the leftist oppressors of economic vanity that must be overcome. Greece has thus become the enemy: the enemy to capitalism, the enemy to neoliberal lust, to the selfishness of right wing economics. In troubling themselves with the livelihoods of real people, the Greek government have unwittingly obfuscated the economic vanity of right wing Europe and now they’re fighting back. We knew that the Troika and purse-string pullers across Europe would attempt to asphyxiate the Greek government and their anti-austerity agenda, but to do it so barefacedly goes only to highlight the mechanical rationality of Europe’s economic hierarchy. Greece holding a referendum, then, marks an opportunity to put power back in the hands of people. The Greeks have one obvious advantage in these historic negotiations: democracy. Democracy is not faceless, as bureaucracy is, and nor is it dictated by numbers on a page. Democracy is driven by a million voices, but these are not the voices of statistics. These are the voices of human understanding and social awareness, of those left to deal with the realities of bureaucratic demands. These are the voices of people. I agree wholeheartidly, Jean , It is a complete feeling of being helpless watching something that you know to be wrong, being dealt out to people who are at the sharp end. The only weapon is true democracy and the majority vote, social democracy scares the neoliberals as they lose their power. Jean, if only it were that simple. A substantial proportion of Greek debt is owed to Eurozone member states – all 19 of them. If Greece defaults, these countries won’t see their money back and will have to find it elsewhere, from their own citizens. That’s why talk of democracy in this context is nonsense. Of course the Greek people don’t want to see their benefits cut. But I would guess that if, say Slovakia had a referendum asking its citizens whether they would be happy to accept the financial pain of never being repaid the money they’re owed, the answer would be no. I guess that the Irish might take the same view. But maybe you think that Irish pensioners should indeed take a hit in order to support Greek pensioners? Why should Greek democracy trump Slovakian (or Irish) democracy? MESSAGE FOR ANTON. Sorry Anton I am unable to reply to your reply! For some reason it just would not let me type. I thank you for your comment. I also bow to your greater knowledge of the situation. I’m Irish, a Republican and tend to take things badly when I see a people in such dire straits. Yes you made a firm case for the Greeks not being baled out and the consequences for the rest of the EU. My sympathies lay entirely with the ordinary man and woman in Greece who through no fault of their own find themselves in this awful situation. Ireland will be paying back t the troika for then next 60 years some have quoted! Generations to come will still be in debt. Again it is the marginalised that have suffered the brunt of this. There are some people who took advantage of the situation in Ireland, made millions and still continue to and the same will happen in Greece. I’m not an economist and don’t really understand the complexities of International Finance…..but I do understand poverty and am only now at the age of 65 starting to have a few extra coins in my purse at the end of the week…..after working all my life from the age of 14. My son, who is a small business owner is living on minimal wage to be able to keep his business open……he works every hour god sends but get no help from government…….as I said, its the people on the edge that the EU should be talking to. The face less beauricrats see only numbers and spread sheets……its people who make up their statistics. Sorry for rambling but I hope you get my point. All the best. Jean – Thanks for your honest and heartfelt reply. I agree with everything you say. Totally agree. The rich 1% need austerity. We in the west have abandoned all semblance of Christianity and our great secular society is going to “hell in a hand cart” our worship at the altar of mammon can only end in despair,everything that ever had any pretence at being a good/proper lifestyle has gone. The Greeks, I hope they are one , overcome any misinformation and fear tactics by these faceless jackals. One would hope there are public meetings big style across their country to explain and hold fast against the EU bureaucratic neoliberal trumpet stenographers and their fear agenda. Time for us all to fight back against this rotten festering ideology. Historical times. We have a crisis of neo-liberalism on the one hand, but potentially, if the Greeks vote to accept the bailout, a crisis for the radical left, who will be unable to govern in the current context, which compounds the neo-liberal argument that there is no alternative. The Greek people face the two nightmare scenarios; vote to accept austerity, or vote no, with the possibility that this will mean leaving the Eurozone, which I think is the subtext of the referendum and one the reason why I think Syriza might fall. Either option is not appealing. What the Greek experience demonstrates is that within both the EU and the Eurozone it is simply not possible to pursue an alternative economic strategy. This is food for thought given next years EU referendum. Initially, I was going to vote yes to stay in the EU – mainly because the right dominate the argument – but the Greek experience has left me in doubt. It does strike me as a paradox that we want to replace one democratic deficit (Britain), with another (the EU). I remember when Syriza won the election, having conversations to a similar effect: this is a great opportunity, but if they blow it, they potentially blow it for all of us looking for an alternative to the neoliberal chokehold of financiers and bureaucrats. Sadly, it looks like this initial hypothesis is unravelling, but they haven’t blown it so much as had their hand forced as a result of impersonal and unfeeling economics. The Greeks will come out of this either in martyrdom or on their knees. I also wonder how many minds this will change re: our own referendum. Call me romantic, but although I firmly believe in the institutional benfits of the EU, there is a line of fundamental moral decency that I think many will share, and many will not want to see crossed. I remember when Syria were first elected, having conversations to that effect: if they blow it they could potentially blow it for the rest of us seeking an alternative to the neoliberal chokehold. Unfortunately, this hypothesis seems to be unravelling, only they haven’t blown it so much as had their hand forced. Greece will thus either go down in martyrdom or on their knees. Given Tsipras’ stance, it seems the former is more likely, which could potentially spark a real continent-wide opposition to ruthless economic bureaucracy. Sadly, these two outcomes are not necessarily independent of one and other. I have also given thought to the idea that the actions of the Troika now could influence our own referendum next year. Call me romantic, but, although I am a firm believer in the institutional benefits of the EU, there is a line of fundamental moral decency that I and many others will not want to see crossed. Apologies for the double post – it didn’t appear to have published at first. And why is it we have to come to sites like Bella and Derek Bateman http://derekbateman.co.uk/2015/06/18/ode-to-joy/ to hear an alternative view? Why is it we get the same old establishment faces appearing on our screens night after night? Could it be that the alternate view rocks the establishment? Greece is just the beginning of things to come. And people need to join together and resist these toxic tyrants that have taken so much from the welfare of ordinary folk. There is no alternative if we the people don’t awaken from our stupor. Surely we don’t want a return to a feudal system? The problem we have is that there is probably half our own population in Scotland who is doing nicely thank you very much and those who are in a complete stupor.Its this fifty odd percent that has to be overcome throughout Europe nevermind Scotland before real change is going to happen.We are on the cusp can we tip it over and start to invent a better world? Greece has been keeping bad company, but that’s about to change with a new partner another orthodox Christian nation, Russia. Stand aside for a new game and player, a very serious player that could make Greece a gas hub to drive a pipeline across the Adriatic Sea to Italy, and continue on to Spain and Portugal encircling the EU with a power and influence grid. Russia actually represents Europe’s best hope for a stable and prosperous outcome. For sure the MSM will keep the little people misinformed about this reality as they do about everything else. I wonder how much Western / European Governments have paid to finance NATO operations in Iraq and Afghanistan, there always seems to be resources available to fund wars and armaments. When our liberty is under threat the dosh is there. Yet Greek citizens are being forced to accept severe reparations for circumstances that the European project should never have allowed to occur. The irony is that Solidarity among European Nations appears only to exist when we jointly require to tackle an external threat. I hope Greeks vote to reject the measures that would see their Nation crushed for decades and generations to come. European leaders need to be sent a clear message that another more realistic and enlightened route must be found. I understand your feelings Allen but you know what war is good for……profit! That one of the reason we have so much of it…..